If the current player chooses the Explore action, they draw a card (could be an ally or a monster) and place it on the exploration track. If it’s an ally, each player in turn has a chance to buy the ally with pearls (giving them to the current player). Each player can only buy one ally during the current player’s turn, and each ally purchased increases the price of the next one. If no other player buys the ally, the current player can choose to take it for free. 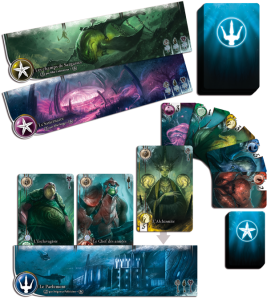 If the card is a monster, the current player can either immediately defeat it (earning various items based on how high the threat level is), or leave it on the exploration track which raises the threat level (which increases the gains from defeating a future monster). If the current player did not take the ally, or defeat the monster, they draw another card and repeat the process. When a player does take the ally or defeat the monster (and they must do that if the exploration track is full), their Exploration action ends and all the cards on the exploration track are placed in face-down stacks according to their type (in the Council area of the board). If a player chooses the ‘Request Support from the Council’ action, they take one stack of face-down allies (that have built up from unpurchased exploration cards). The ‘Recruit a Lord’ action allows a player to buy one of the face-up Lords in the Court area and the cost is paid by discarding the required mix of ally cards (although they do get to keep the weakest). If a player has 3 or more keys, they must purchase one of the location tiles. 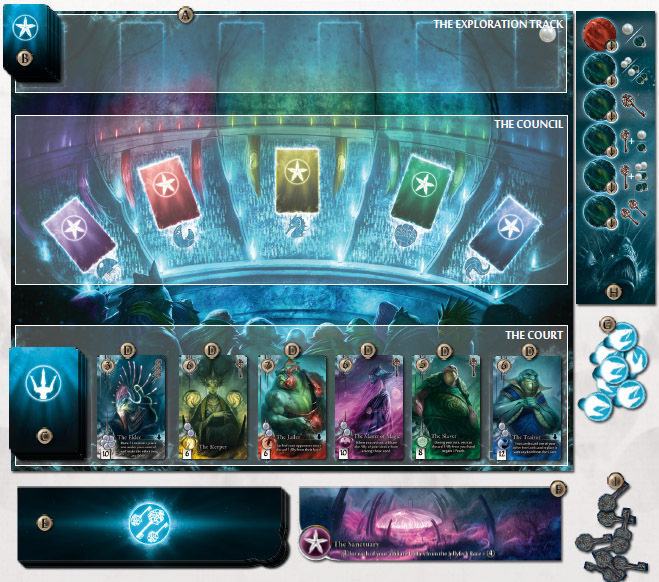 There’s a nice minor game mechanic here which is that, if a player doesn’t purchase from the face-up locations, they can draw 1-4 locations and purchase from those; however, those not purchased are added to the face-up locations – so, the bigger selection you have, the more choices you’re giving your opponents. The game ends when a player recruits their 7th Lord, or there aren’t enough Lords to refill the Court spaces. Players add up their IPs which are based on the locations they control (which earn IPs based on other elements), Lords they have recruited, the most influential ally from each race they have, and monsters they have defeated. Abyss sounds like a relatively straight-forwards game but with a continual flow of tough choices which have several factors within them. Do you buy an ally to help you (and/or deny an opponent) plus increase ally prices for your opponents? Or, do you wait hoping a better ally appears, or maybe hope/risk no-one buys it so you can get it for free using the Council action? Defeating monsters is interesting too as do you take the gains, or let it ride and hope another monster comes up for better gains? It seems like there will be little downtime as players are involved during many of their opponents’ turns, and this should add the benefit that players are more aware of what each other are doing which, in turn, should create more competition over items. You need allies and defeated monsters to gain Lords and locations, but the actual combination of allies, locations, and Lords is very important to score well too, so players need to work out what will have synergy when scoring. For example, Lords are worth IPs, give you keys and have special abilities, but they cost a mix/number of allies which could be worth IPs in other ways. 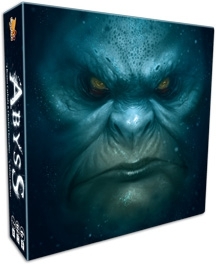 You can read the game details on Asmodee’s website using this link: bga.me/abyss The rules may only be on BGG at the moment. This entry was posted on Wednesday, August 13th, 2014 at 8:10 pm	and is filed under Abyss, Board Games, Essen Spiel 14, Preview, Spiel 2014. You can follow any responses to this entry through the RSS 2.0 feed. You can leave a response, or trackback from your own site.